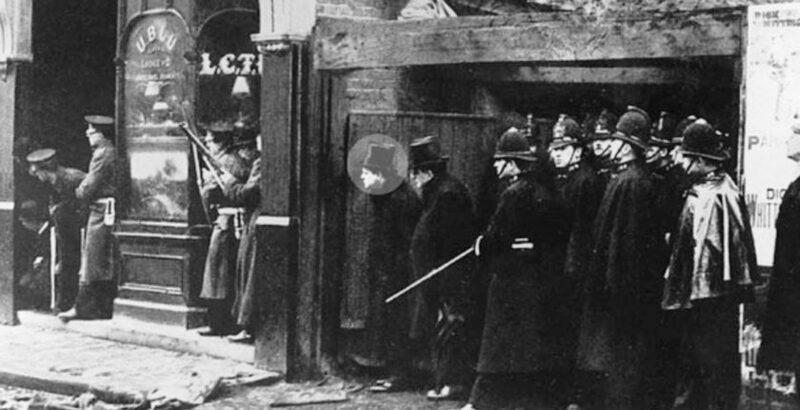 On the weekday morning of 3 January 1911, citizens of London awoke amidst “The Siege of Sidney Street.” Two weeks earlier, well-armed anarchists had tried to rob a jeweler, murdered some police who responded, and then disappeared. They were found holed up in an apartment building and surrounded by Metropolitan Police. Home Secretary Winston Churchill, alerted in his bath, approved a request for support from Scots Guards at the Tower of London. Characteristically wishing to be where the action was, Churchill then appeared in person on the scene. Battle erupted with exchanges of gunfire. Automatic pistols within the building competed with rifle and pistol fire from outside for at least two hours. Either from bullets or breached gas heating pipes, the edifice ignited. The Fire Brigade waited expectantly to put out the blaze, but on-scene, the Home Secretary supported the police decision to let the building burn. The unleashing of martial force against terrorists in an English city can never be a happy event, and Churchill was among the many to offer evidence at an inquest two weeks later. Two criminals had died in the blaze; if there were any others, they escaped. None of the terrorists was British; all were aliens living in London. Such anarchists had ignited an earlier outrage in downtown London. A 1909 robbery had turned into a shooting rampage, block after block, until over twenty innocents were wounded. By the time the Sidney Street gang erupted, the city had had enough of anarchists. By coincidence, the previous February, Prime Minister Asquith had appointed a “new sheriff”: war veteran Winston S. Churchill, aged 36. Churchill’s Home Office held authority over the police and fire brigades alike. The counter-terrorist operation, directed in part by the Home Secretary himself, ended the gang’s reign, but also resulted in a policeman shot and several firemen, constables and civilians wounded. The building itself was wrecked, its owner demanding reconstruction at city expense. As the use of force tends to do in democracies, Sidney Street subjected the decision-makers to close scrutiny. Many theater-goers hooted derisively as the new-fangled newsreels pictured Mr. Winston Churchill moving in and out of cover, consulting with police and their several commanders. In the House of Commons the Rt. Hon. Arthur Balfour, Member for the City of London (financial district), pronounced pointedly: “I understand what the photographer was doing [in the danger zone], but why the Home Secretary?” Mr. Churchill said he’d gone because the Home Office lacked information—and also out of curiosity. Later in his Thoughts and Adventures, he admitted that he probably would have done better to go to his desk in the Home Office. Internationally networked and lethal, idea-driven and fanatical, anarchism was prominent from the late 1880s through the early 1920s. In the beginning, many governments reacted by rolling over. Some authorities seemed immobile; others moved slowly, unwilling to confront a violent international movement. Before World War I, no fewer than six heads of state were murdered by anarchist “idealists.” The militants seemed to come and go across national borders, settling or moving on with near-impunity. On the principle of free speech, some countries protected their fiery publications. In established democracies especially, authority was slow to confine or strike these armed minorities—as was, say, Japan after the series of incidents leading up to the sarin gas attack on subways in more recent times. Churchill’s own Liberal Party had pointedly declined to support a 1904 bill that would have made it easier to deport alien radicals. But growing London violence between 1909 and 1911 would begin to shift Churchill’s views on the rights of non-citizens—and those of many of his fellow MPs. Many familiar aspects of the Sidney Street siege draw our eye today: Should citizens inform police of “suspicious” people, or is this unacceptable in a democracy? Our governments of late have been obscure on this question. In 1911, a former landlord of one of the robbers had stepped up to talk to the police about the attempt to burglarize the jewelry shop. Without his help, law enforcement authorities might never have located the hideout on Sidney Street. Was the use of force justified? Force displeases, and always should, since it poses inevitable danger to innocents. At Sidney Street, force was requisite. Winston Churchill, the authorizing minister, was unusually reflective on these matters. Already the author of eight books and experienced with war on several continents, he was no moral relativist. He believed profoundly in the rule of law. In a later political and violent event, the General Strike of 1926, Churchill was confronted by the question: were the strikers terrorists or freedom fighters? He replied: “I decline utterly to be impartial as between the fire brigade and the fire.” The metaphor suits, when ideological gunmen match force with a nation’s security personnel. Churchill’s on-scene thoughts at Sidney Street included the possible use of a heavy metal shield to protect the constables as they advanced upstairs. The outbreak of fire later rendered this idea inappropriate, yet Churchill remembered it, and incorporated it in World War I, when he pushed hard for development of the tank. After the embers of Sidney Street cooled, he considered the need to arm police better, and promoted trials of new weaponry. How do terrorist groups meet their end? Sometimes—more often than social scientists allow—they expire only after limited use of state force. Two American west coast groups which armed and barricaded themselves and refused to surrender—the Symbionese Liberation Army and its ideological opposite, The Order—expired in hails of SWAT bullets and tear gas in 1975 and 1984 respectively. Actual military units or semi-militarized gendarmes have sometimes been needed, as in Canada for early 1970s terrorism by the Quebecois separatists, or in France for a 1994 hijacking by Algerians. Anarchism was damped down by the Bolshevik Revolution and World War I, but contemporary histories and memoirs make it clear that slow, steady, constructive and often-controversial measures by governments were the most important factor in its decline. Government began to fight back, with tougher laws on incitement; bans on immigrants or visitors known to have anti-democratic and militant views; more focused law enforcement; fewer “passes” on grounds of free speech; bilateral and multilateral intelligence and extradition; and the creation or improvement of domestic intelligence organs like the United States Federal Bureau of Investigation. States declined to surrender to fanatical minorities. The anarchist movement and its handling provide lessons for free societies today. Delays in government response to anarchist violence were classically democratic. So was the difficult decision, in London in 1911, to defend rule of law with a brief interruption of civil norms and a deployment of guns. At Sidney Street, a lawful government proved itself better armed than anarchism. And, unlike the anarchist leaders, Home Secretary Churchill had campaigned for and won election to public office, where his responsibilities included the option to use force. This article was originally published in Finest Hour 150, Spring 2011.